I once read a book called “Necessities.” To this day, it remains one of the best books on sports I’ve ever encountered. The date was April 6, 1987. Campanis was summarily fired. Color me surprised to see that not much has changed over the years. And why would it? After all, this is America. 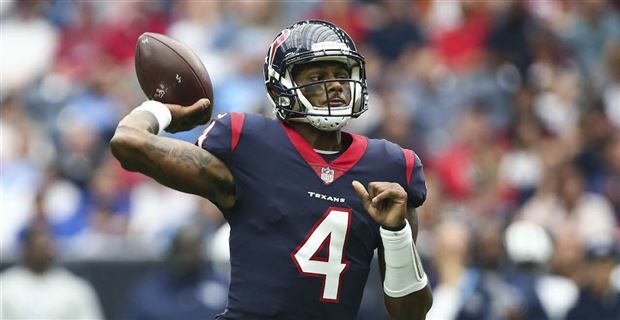 Last week, in reference to soon-to-be NFL superstar – and black – Houston Texans quarterback DeShaun Watson, a Texas school superintendent named Lynn Redden posted on his social media that “you can’t count on a black quarterback.” Watson had just lost a game on the road to the Tennessee Titans and apparently Redden was unhappy enough with both the outcome of the game and the color of the quarterback’s skin to let his own true colors shine through. I guess one can say I grew up a bit naïve when it came to racial inequality in sports. I never gave a second thought as to why there were no black quarterbacks or minorities in the front office. It turns out there was damn good reason for it and it wasn’t, as Campanis and Redden would have you believe, that they weren’t qualified. It has far less to do with necessity and far more to do with opportunity. In the last forty years, one would like to think that race relations have gotten better, that the number of minorities in positions traditionally been dominated by whites has increased. One would think the numbers even bear that to be true but that’s not the case. According to a recent CNN Money article, “The three biggest US sports leagues have just six people of color as principal owners.” Major League Baseball remains at the root of the problem. As recent as 2016, there were only three, non-white Major League managers. Whether we’re living in Obama’s America or Trump’s, racism is still alive and well. We only have ourselves to blame. DeShaun Watson has gotten off to a rocky start in 2018, especially compared to the promise he showed last year, but it has nothing to do with the color of his skin. The last time I checked, Pat Mahomes, the NFL’s hottest quarterback is a young black man. I hope he’s ready for the shots he’ll take when he cools off a bit. The saving grace of this all is that the only job Redden will be able to find after his comments will be at Klan high and from what I understand, their football team is not very good, probably from a lack of black folks. Campanis died in 1998 but his interview still resonates as a tipping point in American sports. Men like he and Redden remind us that our differences have yet to be understood and appreciated. And while minorities still lack opportunities for advancement, likewise men like Redden and Campanis lack the opportunities to show any sort of civility. Last Sunday, a 42-year old black man with a fused back and troubled past proved he’s still the greatest golfer on the planet or at least the most captivating. Meanwhile, segregated golf courses exist in pockets of our nation. So, we continue on as “one nation, under God, indivisible with liberty and justice for all,” with the only real “necessity” being the need for change and the hope that it will come soon enough. This entry was posted in Diamond, Featured, Pigskin and tagged Al Campanis, DeShaun Watson, Lynn Redden, Nightline, Pat Mahomes, Ted Koppel by Chris Humpherys. Bookmark the permalink. We had 8 years of change already. And Tiger Woods is half-black. Why are you denying his Asian heritage? That, in and of itself, is racist. America wouldn’t be able to spot progress when it comes to racism, if it were daubed on the walls of the Oval Office of the White House. What progress presumably made , have been goddamn baby steps, especially when you now consider what this present administration has been doing with regard to the measures in place concerning Brown Vs Board of Education , elements of the Voting Rights Act , regulatory rules in place with regard to predatory lending, how it now views women and the minorities in general. As to racism , let’s be blunt , the incumbent within the White House is a misogynist pig with overtly racist tendencies . How else can you explain his continued close ties to Stephen Miller and Steve Bannon ? I always thought that the ignorance of racism would have dwindled down considerably by now. Look how wrong you can be. However, I have decided to protest against the lunacy of bigotry in my own small but middle finger out kind of way/. I just bought myself a brand new pair of Nike shoes.